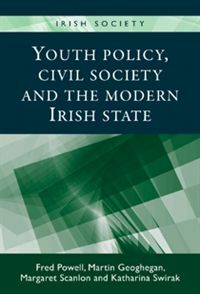 Book Review: Youth Policy, Civil Society and the Modern Irish state by Fred Powell et al. Exploring the development of youth policy and youth work in Ireland from the mid-19th century to the present day, authors Fred Powell et al. provide a strong account of policy changes and facilities made available for young people over the last 150 years. Dr Ken Harland finds the book to be an honest account of the difficult times youth work in Ireland has faced, and commends the authors for their attempts to record and contextualise new definitions of youth work. Youth Policy, Civil Society and the Modern Irish State. Fred Powell, Martin Geoghegan, Margaret Scanlon and Katherine Swirak. Manchester University Press. January 2012. Youth Policy, Civil Society and The Modern Irish State is a refreshing book that brings young people and their issues to the fore in a post-Celtic Tiger Ireland, and questions the dominant image of youth as a problem. Exploring the role of youth organisations in a civil society that has undergone enormous change over the past 150 years, the book discusses the evolution of children’s rights and what youth policy reveals about Irish society. The authors, Fred Powell et al. at University College, Cork, have based the book on findings from a European project involving ten member states funded by a Council of Europe partnership in 2007. Though the title may initially sound like a heavy and over-ambitious read, it is a strong and honest account of Irish history, grounded in the reality and concerns of young people in a society that has experienced broad social and cultural shifts. The authors first consider how Irish identity has been constructed over the last 150 years. They distinguish between the concepts of nationhood and nation, whereby nationhood is defined as “natural and eternal”, and nation is an “imagined political community”. For young people, the construction of national identity has mostly been formed through the promulgation of Irish history, the revival of the Irish language and the popularisation of Irish sports (particularly Gaelic sports). The authors argue that these examples of recent cultural revival, set in a context of militant republicanism and identity-based party politics, have all been key for young people in securing a strong Irish identity. The authors detail how the concept of ‘outcast youth’ which is regularly visible in the media today is not a recent concept and has its roots in the eighteenth century construction of children as grotesque ‘others’. As Ireland began to be shaped by the forces of modernity, urbanisation brought with it severe urban poverty leading to an increase in illegitimate or ‘foundling children’. This darker side of Irish history is powerfully presented and reveals how the Catholic Church emerged as a moral agency, attempting to focus the socialisation of youth through the control of education and social care. This stark reflection on Irish society and the evolution of children’s rights and public policy uncovers an honest but pungent account of history that some people may prefer to keep buried. In many ways it is the underpinning strength of the book. Powell et al. also shed some light on the relationship between youth work, active citizenship and the state, and the co-production of the youth service. The authors discuss how “embryonic” youth work in Ireland, as in the UK, began with volunteers. During the early 19th century there were no formal voluntary organisations as there are today. Therefore youth work was undertaken by women and men in local neighbourhoods, usually motivated by their religious beliefs. This transformed into more organised associations from 1840s onwards with the development of organisations such as the Young Men’s Christian association (YMCA) in 1844, the Catholic Young Men’s Society (1849), Boy’s Brigade (1883), Girl’s Brigade (1893), Scouting Association of Ireland (1908), and societies such as St Vincent De Paul and the Legion of Mary in the 1920s and 1930s. The reliance of the voluntary sector to provide youth work at this time was central to the development of social policy relating to young people and youth work. While the role and purpose of youth work is critiqued in depth and a number of examples of practice are presented, the complexity of how youth work has evolved in Ireland may be of more interest to those associated with youth work than other interested parties. The evolution of youth work is further discussed as the authors reveal how it has struggled to develop an identity of its own, distinct from services such as social work and probation work. Youth work in many countries has faced similar identity struggles, despite evolving in a variety of contexts. For example, large European peace-building funds have meant that for 40 years the purpose and nature of youth work in Northern Ireland has evolved quite distinctly from England, Wales, Scotland and Ireland. Therefore, it is difficult to present youth work as a generic universal service, but that is not to say that youth work does not, or cannot have a common purpose. At the centre of youth work is an emphasis on building purposeful and holistic relationships with young people that places their concerns and issues at the heart of the process. Coming from the north of Ireland, and as someone who has been involved in youth work for 25 years, I can appreciate how history shapes everyone who lives in a particular society. The book makes no links with the ‘troubles’ of the north, nor fully addresses how youth work has evolved separately in Northern Ireland. However, this is a book about youth policy, civil society and the modern Irish state, and therefore perhaps sensibly, steers clear of how youth policy and youth services evolved throughout the whole of Ireland. Readers will be impressed by the authors’ attempts to record and contextualise new definitions of youth work and youth organisations, in particular the growing partnership between voluntary and statutory agencies in the co-production of a new youth service in Ireland. The lack of clarity about the nature and purpose of youth work may be why it has historically played second fiddle to both formal education and other professionals working with young people. This may also be why youth work has been undervalued or misunderstood by other professions and why it has found it difficult to access sustained sources of funding. Dr. Ken Harland lectures in Community Youth Work and is also Co-Director of the Centre for Young Men’s Studies at the University of Ulster, Northern Ireland. He has extensive experience as a youth work practitioner, trainer and researcher into issues affecting young people with particular expertise in working with adolescent boys around themes such as masculinity, violence, mental health, underachievement and youth transitions.